I met a girl once. We got together casually a few times. I liked her very much for a few hours. Then something changed. She came to my house for dinner. We had some food and some wine. I listened attentively as she bemoaned the alcoholism of her ex-husband while quickly refilling my glass to the brim whenever I took a sip. I thought about how amoebas surround and engulf their prey and dissolve them into nothingness. I became desperate for her to leave. Later, I called her to say I couldn’t do this. She wanted to be friends. I wanted to let things settle for a few days. I emailed her and told her I couldn’t be friends. 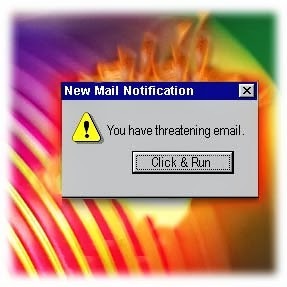 Then she let loose a barrage of increasingly mean emails. Later, a friend advised me that she was trying to provoke a reaction from me. I had indeed reacted, and had set up my email to divert her assaults to trash. Anyway, a few months have passed. I fear I missed the chance of a lifetime entanglement of pathologies that would make the rest of my life look great in comparison. Actual true story, you guys. Sounds like you'd have been better off if you just broke a mirror and taken a few years of bad luck. Ouch... 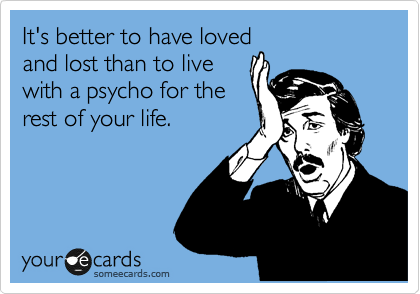 Sounds like most of my relationships.